Can this be used neat and then rinsed with water afterwards or does it have to be diluted? We recommend that this product is diluted in 125ml doses. Suited to a wide range of projects from kitchen maintenance to general cleaning, our Gompels Heavy Duty Degreaser has a powerful formulation. As part of our Concentrated Chemicals range, this large 5 litre bottle boasts a comfortable handle and screw down lid for safe storage. The unfragranced mixture has a non-tainting design that makes it suited for use in areas of food preparation while also working well on walls and kitchen surfaces. The concentrated design allows it to be diluted down - further extending the usage gained from a single bottle - alongside allowing a more intense cleaning process for ingrained or hard to shift soils. This double packet is an economical choice for all businesses and can be stored away easily until required. For a more hands on approach, our ready mixed and trigger bottled Gompels Degreaser Spray comes in a 6 pack of 750ml containers. 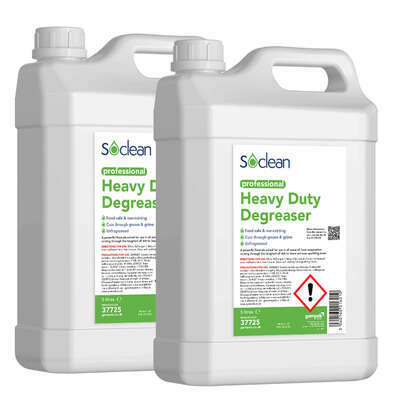 We also stock convenient Labels for our heavy duty degreaser, allowing you to distribute out this formula to your cleaning staff with ease.